This entry was posted in Economic Forecasts and tagged Consumer Metrics Institute, economic forecasting, economic indicators on March 31, 2010 by Ted Kavadas. In the previous blog post I wrote of the issues and implications regarding the current economic growth rate. There are a variety of sources and methods one may use in trying to gauge current and future economic growth. In this blog I frequently highlight and discuss many I feel are prominent and/or noteworthy. However, I am constantly searching for new sources as I feel that many of the well established, existing indices and methodologies have inherent weaknesses. These weaknesses, in many cases, are being magnified and exacerbated in our current economic environment. One source of forecasting economic trends that I have recently become aware of is called “The Consumer Metrics Institute.” This site uses proprietary methodologies that appear quite disparate from those used by others. I’ll probably comment more on these methodologies later; however, for those interested the FAQs section as well as various other pages on the site provide an overview. Their methods are yielding statistics that I find most interesting, both with regard to our current economic condition, as well as those pre-dating the 3Q/4Q 2008 financial maelstrom and aftermath. In aggregate, I interpret the data shown by The Consumer Metrics Institute to show that current economic growth is not as strong as widely depicted and believed. Based upon their data, I infer (based on this data) that the economy may be far more vulnerable to significant economic weakness than widely envisioned. It is always hazardous to place too much reliance on one data source, especially when it comes to economic forecasting. As well, it is easy to view the non-confirming (vs. highly established economic forecasting sources and widely held economic expectations) nature of this Consumer Metrics Institute data with skepticism as it belies many underlying consensus beliefs and associated data sources. However, I think this is a potentially very valuable source of information and I plan on monitoring it diligently. It will be included in my frequent updates of economic indicators. 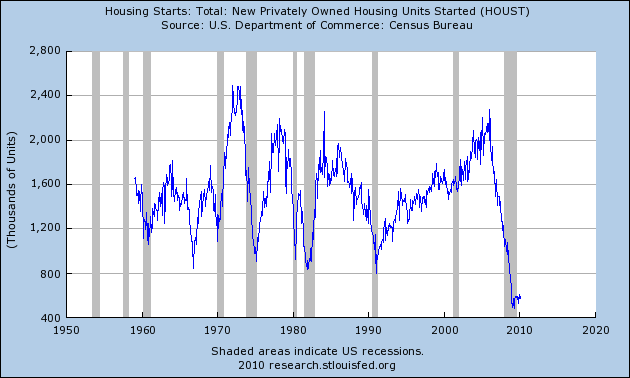 This post, and the next, will deal with economic activity and economic indicators. My most recent update of various economic indicators was on March 15. One indicator that I have yet to add to this list is that of the Chicago Fed National Activity Index. 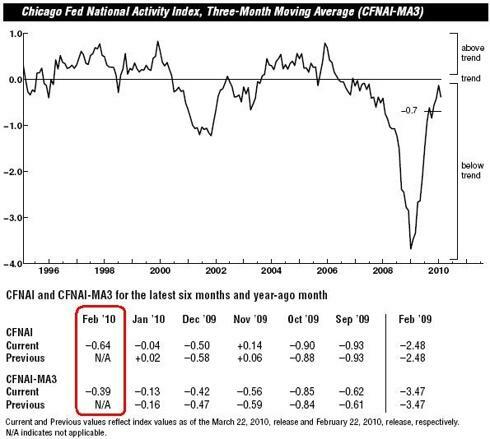 Many people believe the Chicago Fed National Activity Index to be the best, or among the best, indicator of economic activity. Among its strengths is its broad nature, as it is comprised of 85 individual indicators. Overall, one can see the chart depicts the 3-month average as still being “below trend” after making a strong rebound off the early-2009 lows. What I find interesting in this data is that it seems to indicate that the rate of economic rebound appears to have peaked. This same indication is seen in many of the economic indicators shown in the March 15 post. If it true that we are now off-peak in terms of the rate of economic growth, the pivotal question becomes what will be the going-forward growth rate. As shown in the various economist forecasts that I have posted, most economists (as well as other professionals) are assuming a growth rate consistent with full-year GDP of 3%…i.e. relatively steady growth for the rest of the year. However, there are also some who think a “double-dip” or other resumption of weakness is likely. 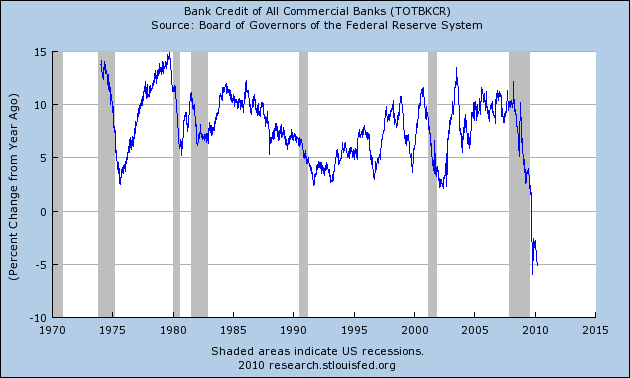 Is it possible that the rate of economic activity is already on a faster than anticipated decline? 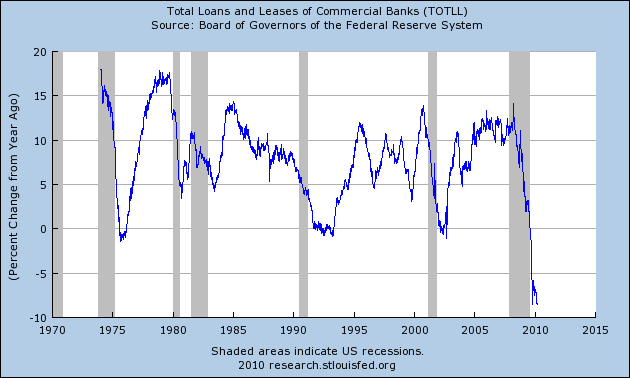 It appears too early to definitively say, based upon this CFNAI and other indicators. However, this possibility is something that I certainly think bears close monitoring as the implications of such could (dependent upon the extent of such weakness) be enormous. 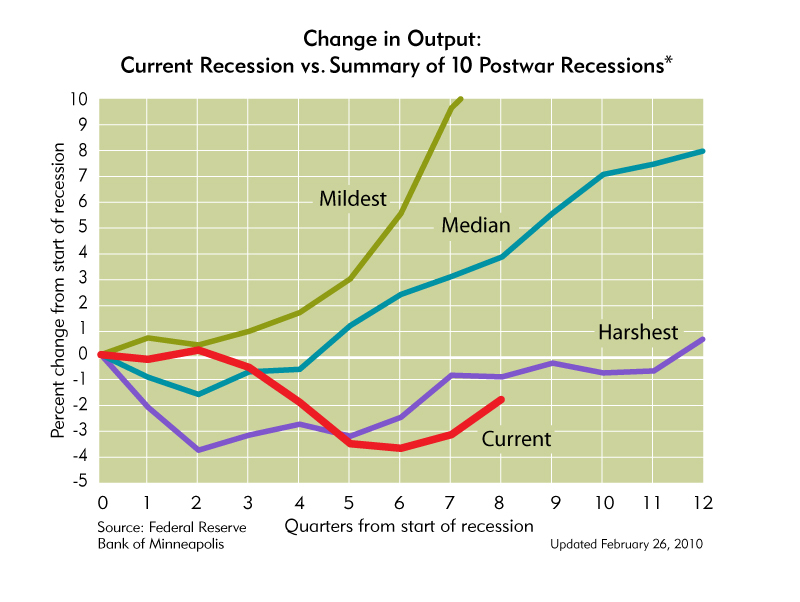 This entry was posted in Economic Forecasts and tagged Chicago Fed National Activity Index on March 30, 2010 by Ted Kavadas. I have written extensively about the residential real estate problems and dynamics thereof. It strongly appears as if we, as a nation, have come to a place where there is hardly a real estate intervention that we don’t like. I think this situation is one filled with peril, as I strongly believe (and have written extensively of) the unintended consequences and hidden risks of interventions. This entry was posted in Intervention, Real Estate and tagged residential real estate on March 29, 2010 by Ted Kavadas. As a continuation of yesterday’s post, here are three other charts that I find disturbing in nature. These charts raise a lot of questions. Many of these questions I have discussed in the blog, as I believe they are very significant in nature. Additionally, these charts should highlight the “atypical” nature of our economic situation from a long-term historical perspective. More about these last two charts can be found in this previous blog post. I will update these charts on an intermittent basis as they deserve close monitoring. This entry was posted in Uncategorized and tagged disturbing charts on March 25, 2010 by Ted Kavadas. 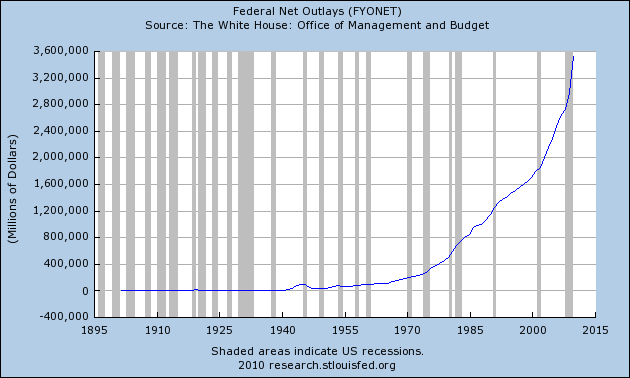 In the next two posts, I am going to display various charts that I find disturbing. 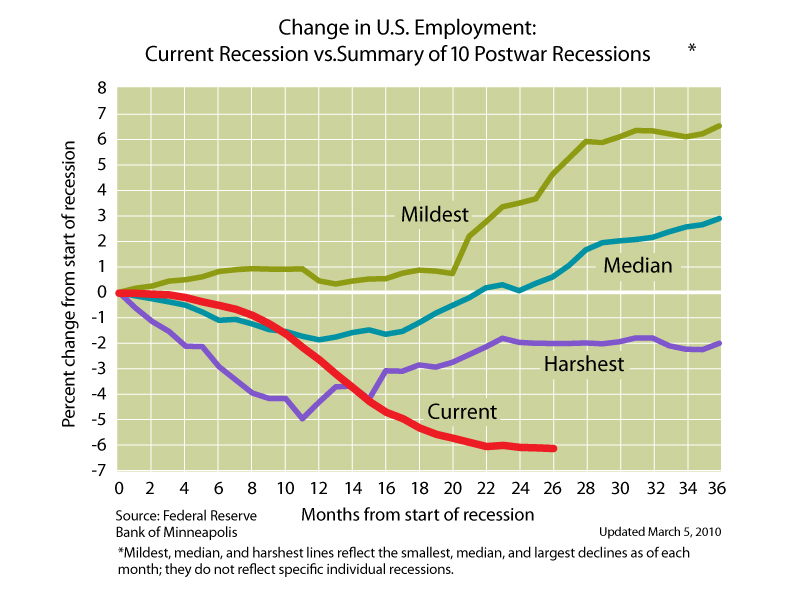 These charts would be disturbing at any point in the economic cycle; that they depict such a dismal situation now – 9 months into what most believe is an economic recovery – is especially notable. Many more such charts exist, unfortunately. I also regularly discuss many troubling aspects of our economy in this blog. As well, I find many aspects of the financial markets to be problematical. Those aspects will be covered in the near future. All of these charts are from The Federal Reserve. 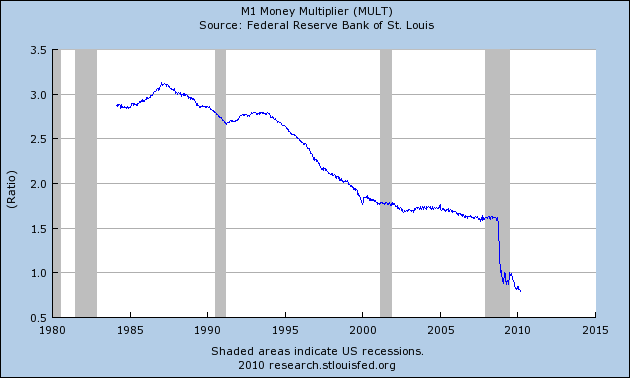 Charts in this post are from the St. Louis Federal Reserve. 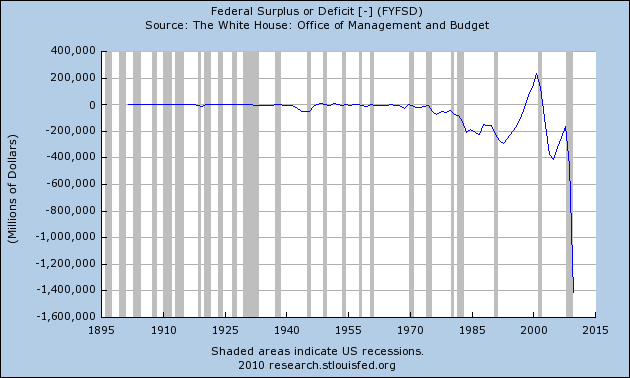 I especially find these charts valuable as they depict our current situation in a longer-term historical context. This entry was posted in Uncategorized and tagged disturbing charts on March 24, 2010 by Ted Kavadas. Last Thursday, Alan Greenspan’s “The Crisis” paper (pdf) became available. I assume this is the paper that Alan Greenspan has previously spoken of, as seen in my previous post on his defense of his tenure. For now I simply want to post a link to the paper. I may further comment upon the paper at a later time. I think the paper is valuable in that it provides a unique perspective on the financial crisis. However, I don’t agree with many of the points made in the paper. This entry was posted in Uncategorized and tagged Alan Greenspan on March 23, 2010 by Ted Kavadas. I would like to make a few comments regarding the health care legislation. I’ve written a few posts mentioning health care; here are the most substantive. First, as I’ve previously written, the health care system that we now have needed to be changed. 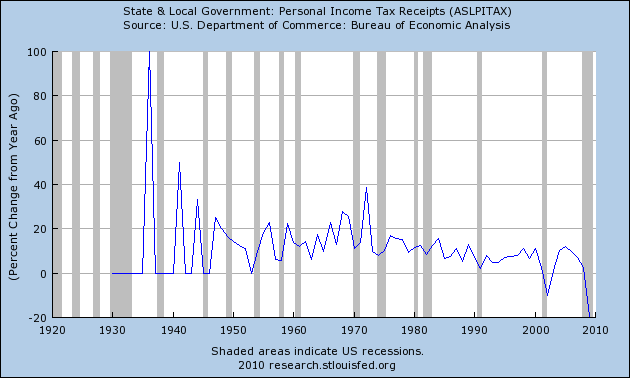 It clearly has evolved into something that is unsustainable economically as well as clearly suboptimal in other areas. However, I don’t view the legislation voted upon last night as a good solution. Although some aspects of it appear, in a general sense, to be laudable – such as making health care attainable to a broader audience – from an “all things considered” basis I believe that it doesn’t solve many underlying problems. Furthermore, it will likely create new problems. We, as a nation, had the opportunity to fix a long-standing “mess” and, as the future will show, we’ve failed to enact an effective solution. This scenario, of having opportunities to address major problems, and subsequently failing to enact effective solutions, is recurring in an increasing fashion, unfortunately. This entry was posted in Uncategorized and tagged healthcare on March 22, 2010 by Ted Kavadas. On Thursday President Obama signed the HIRE Act, a jobs stimulus. The summary of the signing can be found here. There is also a transcript of his remarks found here. I could make many comments about this jobs stimulus. However, as an intervention measure, it has many of the same characteristics of other interventions. As such, my previous extensive comments about interventions are highly relevant. Those posts can be found listed under the “Intervention” Category. First, the ARRA was supposed to be a “jobs creation” legislation. On various levels it has not performed as intended with regard to job creation. As I’ve pointed out before, we should be very cognizant of how previous stimulus bills have fared before enacting new ones. Second, in President Obama’s comments he said, “I’m signing it mindful that, as I’ve said before, the solution to our economic problems will not come from government alone. Government can’t create all the jobs we need or can it repair all the damage that’s been done by this recession.” This entire idea of “creating” jobs or “stimulating” job creation needs to be intensely scrutinized. Should government be attempting to “create” jobs – as seems to be the current widely accepted theory – or should job creation and job growth be an inherent feature of a strong economy? 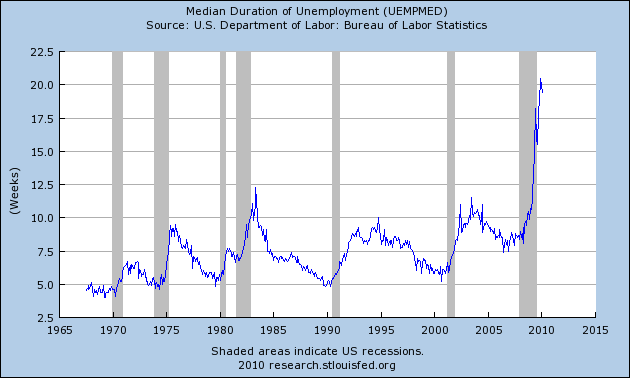 This entry was posted in Intervention, Unemployment and tagged Intervention, Unemployment on March 21, 2010 by Ted Kavadas.